Ice Coffee, along with Ice Tea is very popular in Thailand. The best, if you can find it, is still made the old fashioned way, filtered through a "sock". Here in Hang Dong, just on the outskirts of Chiang Mai is "The Coffee Lady" who makes the best Iced Coffee around. She'll customized it any way you wish (less sugar, more condensed milk, or whichever way you take your coffee) and always with a huge smile. Her sidekick is always around helping, but rarely smiling. I rarely try to cook while traveling, especially for a group. It always smacks of "Two Fat Ladies" trying to trap rabbits in the field and cooking around tents and campfires for a bunch of boy scouts. Although I have done it in the past, here in Thailand it always seem so easy just to grab something delicious on the street. We're staying with our friends Malcolm and Pic at their lovely home in Hang Dong, just outside Chiang Mai. Our friend Ben, who is an excellent cook, has no problem cooking anywhere so on this occasion he chose to whip up some paella for our group of seven. It of course involves shopping for a variety of ingredients, many of which are readily available, in fresh supply, here in Thailand. Then there are those few choice items needed for the success of paella which are a little more difficult to find. The luxury of a fully stocked kitchen to work in always helps when cooking anywhere. The finished product was delicious, served with fresh button mushrooms and green beans. Well done Ben. I can say I helped, even if it was only a little chopping and cleaning up. M&P's home, which was completed last year, is what could be called modern northern Thai. Beautiful simple lines with Lanna flair. 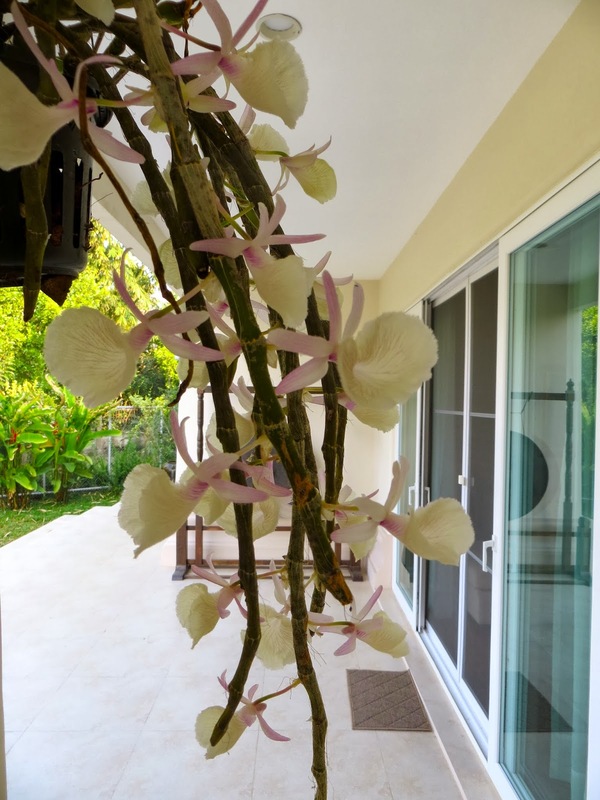 Malcolm's orchids are scattered throughout the garden. It's always fun to run into friends while traveling. This of course was a planned stop for us and we're enjoying every minute of it.